Overall Background: The passage we just read in chapter 4 is very important to understand the gospel. In the past three chapters, God through Paul is setting the stage for the gospel. The first thing that Paul does is point out two groups of people who exclude themselves from the gospel. The first group we met in chapter one. They are the “unrighteous” – they suppress the truth about God; they shake their fists towards heaven; they feel that they are good enough. Romans 1:18 tells us that “the wrath of God is upon them.” They excluded themselves from receiving the gospel of God. The second group who rejects the grace of God is the “self-righteous” – they are those who compare themselves to the unrighteous; they look down on the pagans; they are proud of their works. Romans 2:5 tells us that they are “treasuring up wrath in the day of wrath.” They excluded themselves from receiving the grace of God. Application: This morning examine yourself. Are you suppressing the truth of God? Are you self-righteous? If so, then you are excluding yourself from the grace of God. In chapter 4 God through Paul is going one step further. Now he wants us to understand that none of us can bring anything to God. The moment people understand the gospel—that Christ died for us; that He shed His blood for us; they feel like they need to do something—they feel like they need to clean up before they come to God; they feel like they need to be a better person; they feel like they need to earn their salvation. GOD calls those things WORKS. He does not want our good works because when we bring our works, we begin to boast in ourselves; we begin to take the credit that belongs to God. Application: There are people here this morning that are doing exactly what I have described. You are trying to bring your WORKS to God and He wants you to you just the way you are. In order to help us understand this, Paul is going to tell us three things. Listen to verse 1—What then shall we say that Abraham our father has found according to the flesh? Listen to verse 2 “For if Abraham was justified by works, he has something to boast about, but not before God.” If Abraham could bring his good works to God, then he would have something to boast about before God. You remember what Paul said in Romans 3:27, “Where is boasting then? It is excluded.” Meaning: When it comes to the gospel, God will not share the credit. He wants to do it all. God gave Abraham the FACTS. God gave Abraham the gospel because through his descendants Jesus was to come into this world. God gave Abraham the FACTS and Abram placed his FAITH in the FACTS. He placed his faith in the facts of the gospel. That word “accounted” is the same as count or reckon or impute. Meaning: When Abraham believed the gospel, God credited his account with the righteousness of Christ. Application: There are people sitting here this morning. God is giving you the facts. He is telling you, “I love you;” He is calling you to look to His Son, Jesus Christ, and be saved; He does not want your good works; he does not expect you to clean up; he does not want you to become a better person. He wants you just the way you are. Are you lost, just place your faith in the facts of the Gospel—you are a sinner; Christ died for you; believe that He is your Savior and you will be saved. Listen to Romans 4:4-5 4Now to him who works, the wages are not counted as grace but as debt. Meaning: If I bring my good works to God; if I clean myself up before I come to God, then I get what I deserve. I will never understand the grace of God. I can sing “Amazing Grace, how sweet the sound that saved a wretch like me” but if I don’t believe that I am a wretch, I will never mean it. Most of come with something in our hands and no wonder we cannot receive the grace of God. To the contrary, 5But to him who does not work but believes on Him who justifies the ungodly, his faith is accounted for righteousness, Meaning: When you come simply by faith, it gives God the opportunity to show His grace towards you. Like the Pharisee and the tax collector who went to the temple to pray. The Pharisee bragged about how good he was while the tax collector beat his chest and cried, “God, be merciful to me a sinner.” Jesus said that tax collector went home justified, not the Pharisee. First, God imputes the righteousness of Christ on our account. Second, God imputes our sins on Christ. This is very important to understand. If all God did was impute my sins on Christ, my sins would be forgiven but I would be neutral towards God. We would be like Adam and Eve before they sinned. But God not only forgave me of my sins but He also gave me the righteousness of Christ. He declares me righteous. Now when God sees me, he no longer sees a sinner. He sees Christ. Application: Many of you this morning have done some horrible things and you feel like God is looking at you with a frown. To the contrary, he is looking at you with grace and compassion. He is willing to forgive you and cover your sins and set you free. He is willing to gift to you the righteousness of Christ. People may bring up your sins, you may bring up your sins, but God will never bring up our sins. So, Works Have No Place in the Gospel; Faith Imputes the Righteousness of God. Here come the feelings. Abraham is 99 years old. Too late…God is not going to send a son; God has forgotten about me. But he trusted God. Remember – the order of the Gospel is first FACTS, then FAITH, AND then FEELINGS. If you switch that order for any reason, you will miss your salvation. Not only that, but the order of your salvation is also the order in how you live your Christian life—first FACTS, then FAITH, and then FEELINGS. 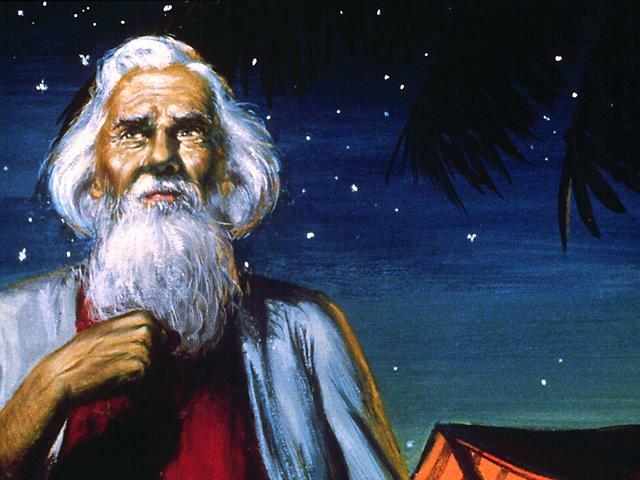 So what does Abraham’s story have to do with us? Listen carefully: 23Now it was not written for his sake alone that it was imputed to him, 24but also for us. It shall be imputed to us who believe in Him who raised up Jesus our Lord from the dead, 25who was delivered up because of our offenses, and was raised because of our justification. Application: This morning, I want us to listen very carefully. If you are lost, you need to hear the facts, place your faith in the facts, and then let the feelings follow. Why is this message so important? What you believe about salvation determines how you live the rest of your Christian life.